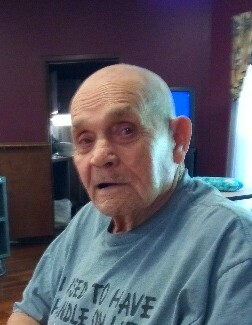 Charles Ernest Duckett, 90, of Trinity, passed away on April 9th, 2019 At Shannon Gray Rehabilitation Center located in Jamestown, NC. Charles was born in Chickamauga, Georgia to Lawrence Edward Duckett and Essie Bell Duckett on April 28th, 1928. He worked as a truck driver hauling logs for most of his life. He also served in the US Army. Charles is preceded in death by his wife May Inez Crout Duckett, son Charles Leslie Duckett, mother Essie bell Duckett, father Lawrence Edward Duckett, brothers Junior Duckett, Billy Duckett and Wayne Duckett, sister Maxine, Dot and Helen. Charles is survived by his son Lawrence David Duckett, daughters Aleta Duckett Varner, Judy Duckett Chappel and Sharon Duckett Hedgecock, brother Bobby Duckett. Charles was also a grandpa of ten grandchildren and a great grandfather to multiple great grandchildren. A memorial service will be held at 5pm on April 13, 2019 located at 6315 Old Mendenhall Rd, High Point, NC 27263.